The Head and the Topsides. One of the big problems we are facing is getting some of the vendors on the boat to finish the rigging and engine work, very frustrating. The tag line we are getting very used to hearing is we will be starting next week. The frustration on our part is that there are not many more weeks to get started! Every week I check in with them, and we realize this is a busy time for everyone getting boats in the water, but we are at a time crunch and the stress level is kicking up. The thing is there are a lot of projects 90% done but the 10% that needs to be finished is giving us 90% of the headaches! 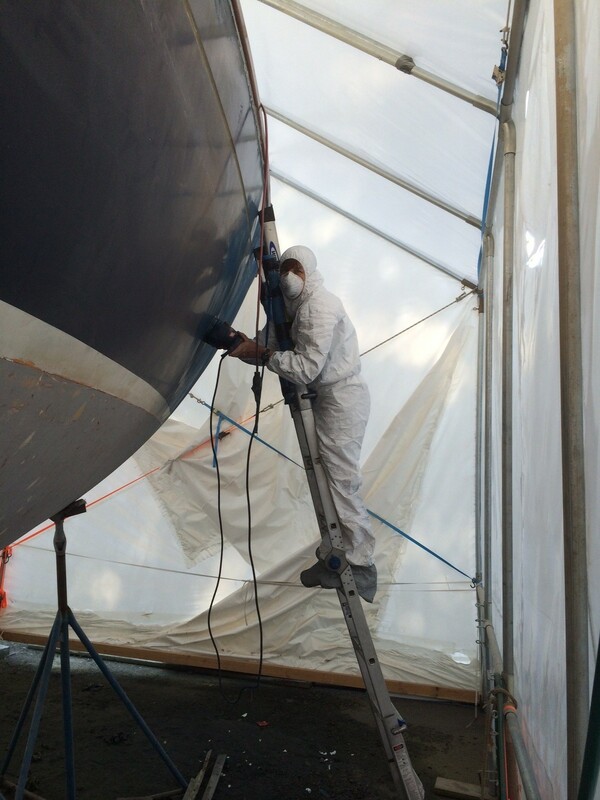 Brian finished running all of the water hoses on the port side yesterday, which allowed him to install the holding tank in the head. 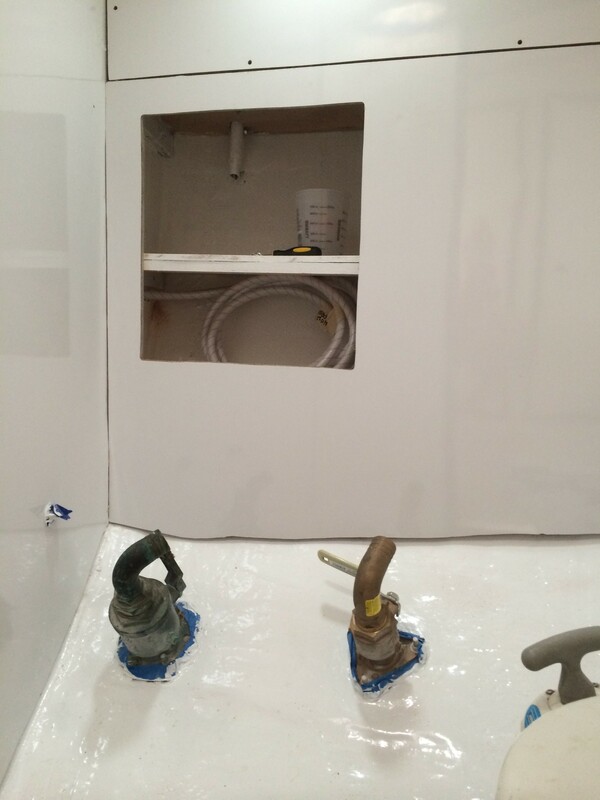 Now that the holding tank is in place, the walls and the vanity were laminated and put in place. 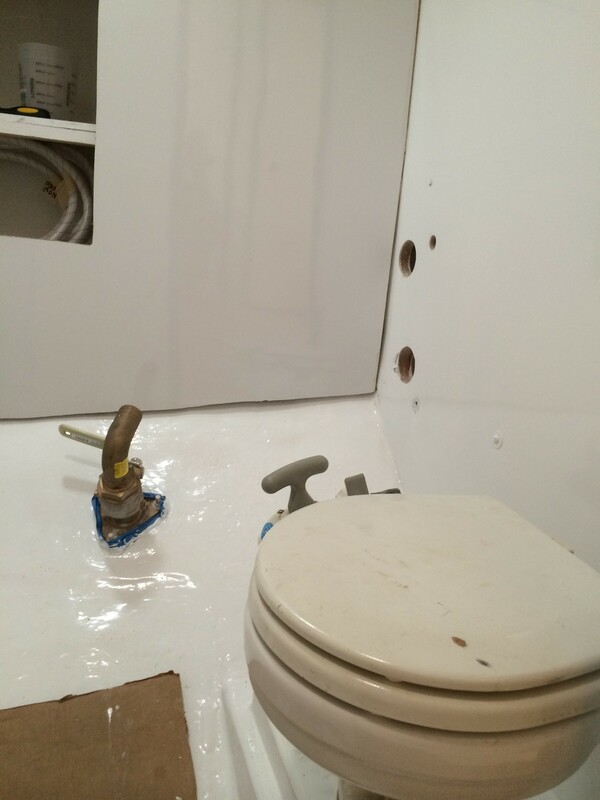 The toilet was dry fitted today as well. As I type, he is in the garage cutting teak strips for the floor grate for us to finally have a shower (and have I mentioned we will have hot water on the boat for the very first time!). Once again, the head is 90% done. 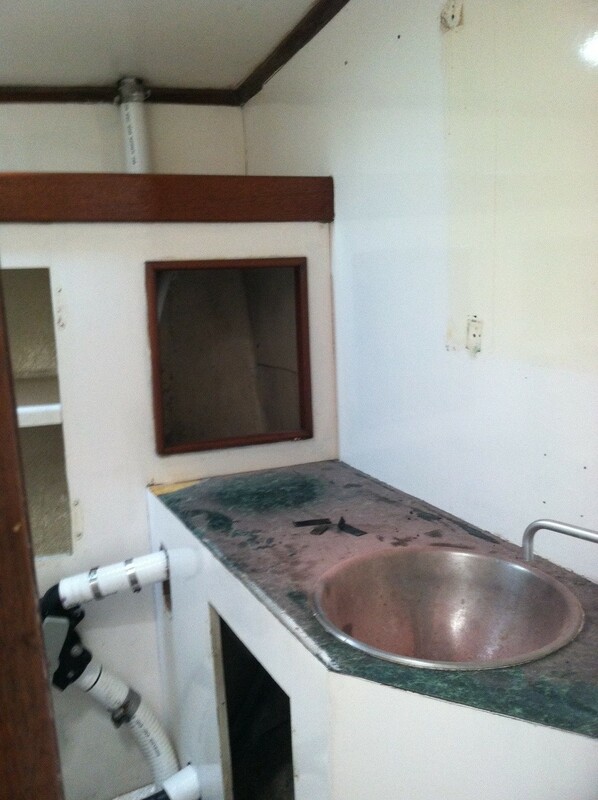 I am going to post some before and after (but not quite done) pictures so you can see how much has changed. 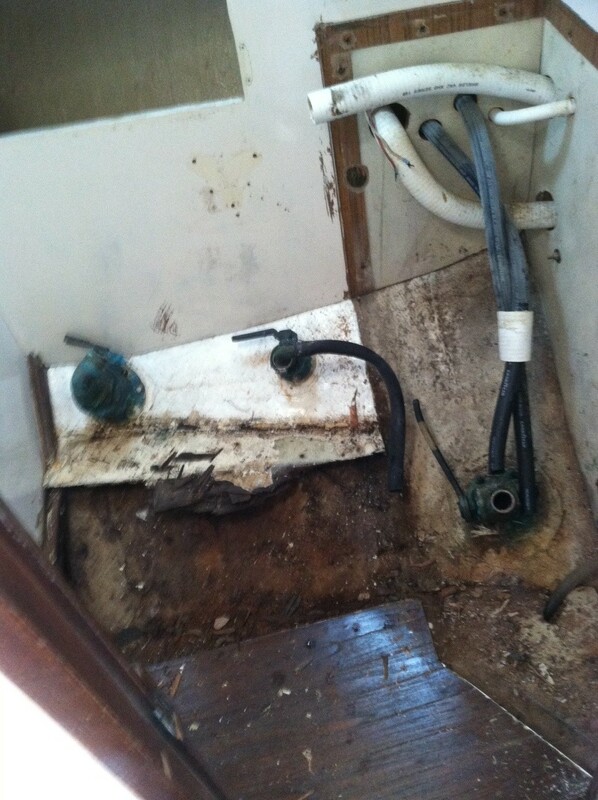 This is one area where we did gut the entire space and start from scratch, including taking out old valves, fiberglass the hull where they were and drilled new ones for the new layout. 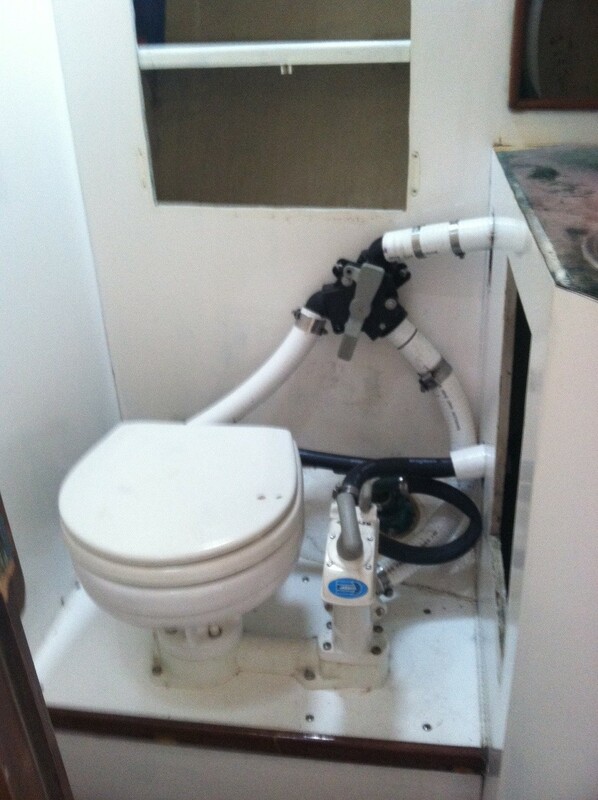 The holding tank was moved into the head on the shelf so no longer under the V-Berth platform. 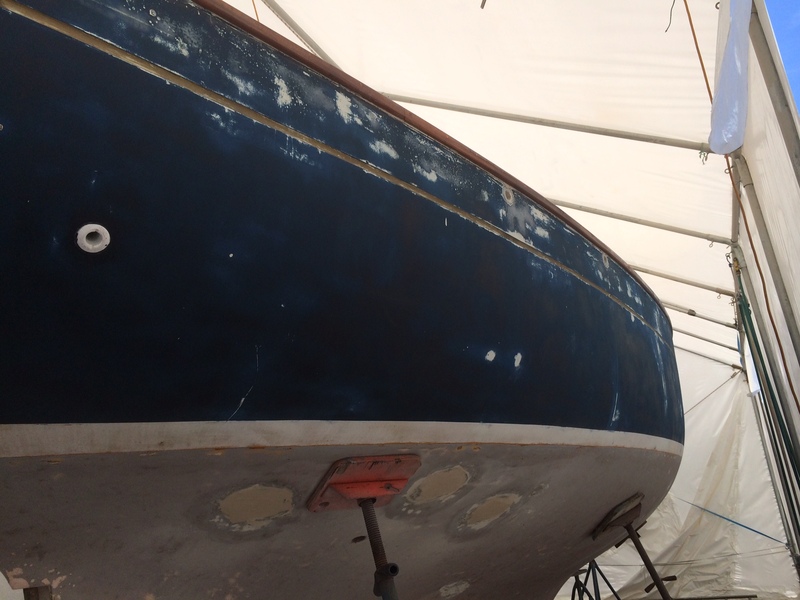 My project today was to start the sanding process of the topsides, or the blue hull of Scout. 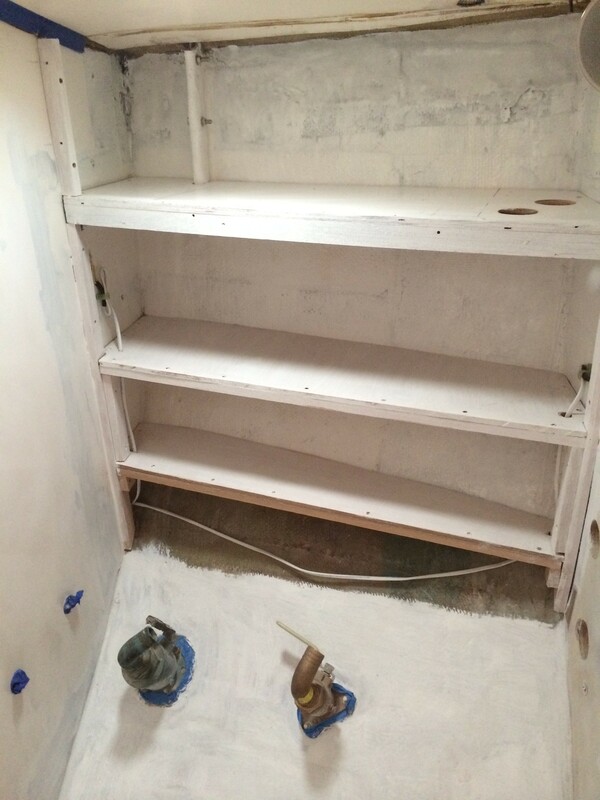 I dressed in a Tyvek suit, mask, booties and climbed the ladder and started sanding. Within minutes I was Little Girl Blue! 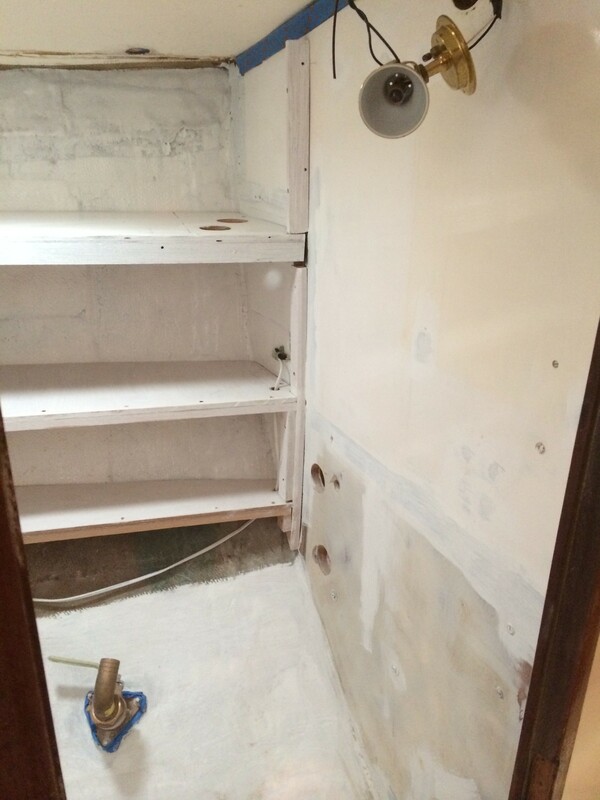 There was a lot of blistering, gouges and cracks in the fiberglass that needed to be sanded and some will need to be filled. 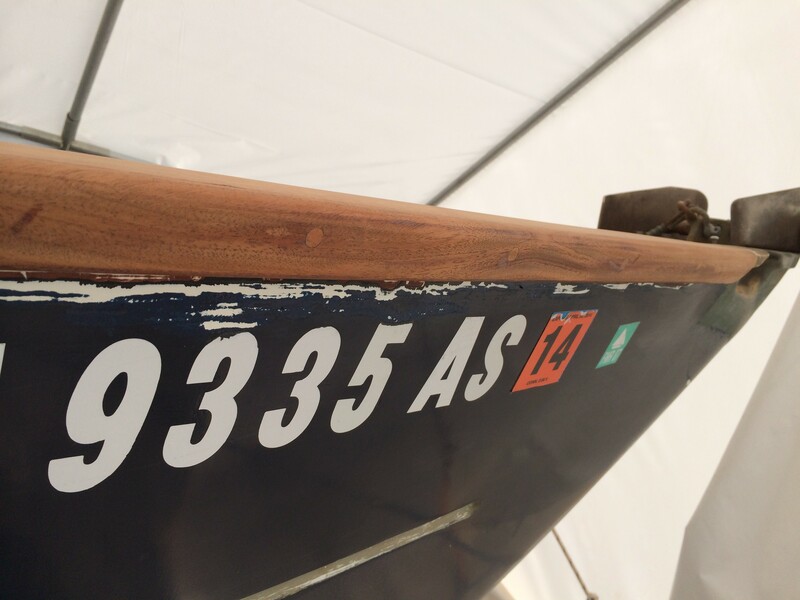 After 4 hours of sanding, I am happy to report the hull is completely sanded, I was drenched inside the suit, and my hands were a lovely shade of navy blue. I am happy this is one thing I can do to take off of Brian’s do list, next thing he will teach me is how to mix the resin to fill the defects. Once that is done and sanded, I move down to the bottom of the hull. 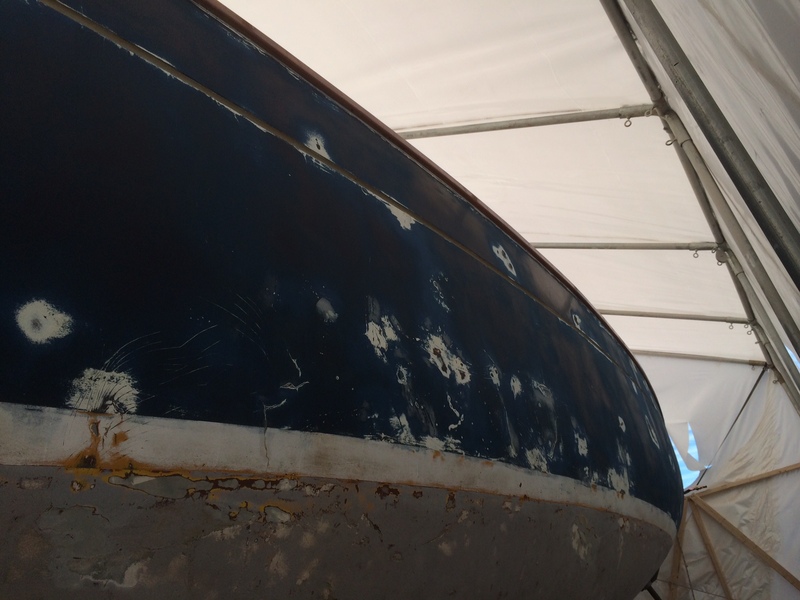 He still has some fiberglassing to do there where the hull was damaged by a derelict mushroom mooring but I think my whole month of June will be wearing a Tyvek suit. Now I am not sure I am going to be able to lift my arms above my head tomorrow at work. Oh, yeah, did I mention we sailed on our baby boat today too! A perfect late spring day for a couple hours of sailing. Nope can’t get much better than today. 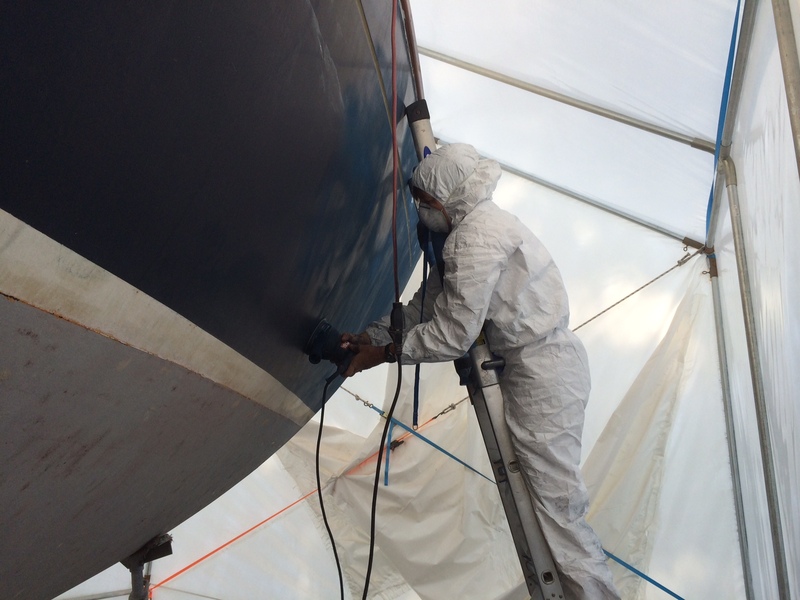 « The deck is all sealed up, sort of!